Arun District Council’s local plan – which sets out a vision for thousands of new homes across the district in the coming years – has today been given the backing of a Government inspector (Thursday, July 5). Councillors were informed in an email this morning by cabinet member for planning John Charles that inspector Mark Dakeyne had approved the major housing and regeneration blueprint. Mr Charles said the plan had been found legally ‘sound’ – but Mr Dakeyne’s final report confirmed it would only be so after a series of modifications to the document submitted at a public examination last year. The email to councillors stated: “Earlier this morning I received a communication from the planning inspector regarding our local plan. “It is with great pleasure that I inform you that it has been found sound (approved). “Full information will be provided with the full council agenda and any debate can be held at the meeting on the 18th July. The plan has been years in the making, courting controversy every step of the way. Numerous setbacks saw the plan’s progress delayed, with government targets for housebuilding creeping ever higher in the background. The plan, covering the period 2011 to 2031, was initially submitted for examination by a Government inspector in 2015. Back then, the annual target for building new homes was 580 – but the figure rose to 641 later in the year after new population statistics were released. The plans’ progress was suspended in July, 2015, when an inspector recommended more work was required, particularly around the amount of homes the district should accommodate. When the latest version of the plan came before the inspector in September of last year, Arun proposed a new target of 1,000 homes per annum – 20,000 over the plan period. The plan does not mean planning permission will be automatically granted for any major housing project but it does set out how Arun could achieve the overall target. 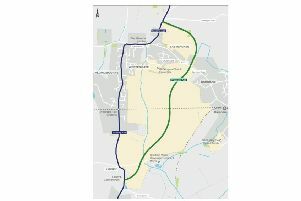 It includes a vision for thousands of homes for the likes of Bersted, Pagham, Barnham, Eastergate and Westergate, among others. Littlehampton’s West Bank is also earmarked for around 1,000 homes. Reacting to today’s development, Bognor Regis Liberal Democrat councillor Francis Oppler said: “There is nothing to celebrate or be happy about. It is an earthquake. Littlehampton town councillor Derrick Chester, who attended last year’s public examination, said he was digesting the detailed, 41-page inspector’s report. But on initial inspection, he said the proposed modifications ‘looked positive’ and indicated Mr Dakeyene had listened to some of the points made during the hearings. This was despite all the proposed major housing allocations being deemed suitable, he said. Without an updated local plan in place, Arun has faced difficulty in resisting numerous contentious developments. Some of its key planning policies were deemed out of date because the council could not meet its obligations to demonstrate it had the required supply of land to meet housebuilding demands. Supporters of the plan have noted its adoption would provide Arun with greater control in deciding where building is – and is not – suitable.